If you have any questions about the AURORA A information page below please contact us. This generous luxury yacht AURORA A is a motor yacht. This 49 m (162 ft) luxury yacht was made by Admiral Marine Works in 1993. AURORA A used to be Evviva. Superyacht AURORA A is a majestic yacht that can accommodate as many as 10 people on board and has around 9 professional crew. Launched to celebration in the year of 1993 her reasonably modern interior decoration proffers the traditional interpretations of Donald Starkey Designs. The yacht's general design work came from William Garden and Donald Starkey Designs. The formal naval architecture drawings are the work of William Garden. Motor Yacht AURORA A received her elegant interior designing from the interior design skills of Donald Starkey Designs. the United States is the country that Admiral Marine Works completed their new build motor yacht in. After her formal launch in 1993 in Port Townsend Wa she was afterwards released to the happy owner having completed final finishing. Her core hull was constructed with composite. The motor yacht superstructure is made predominantly from composite. With a width of 9.11 metres / 29.9 feet AURORA A has spacious size. A fairly shallow draught of 2.96m (9.7ft) limits the number of certain marinas she can enter into, contingent on their specific depth. She had refit improvement and modification carried out by 2005. This ship contains twin powerful MTU main engine(s) and can attain a exalting max continuous speed of 30 knots. The main engine of the ship generates 3480 horse power (or 2561 kilowatts). Her total HP is 6960 HP and her total Kilowatts are 5121. Her propulsion units are twin screw propellers. For stabalisers she was built with Naiad. Regarding bow thruster maneuverability she was built with Hps. This yacht’s vivacious cruising speed is 22 knots which provides a range of 4000. 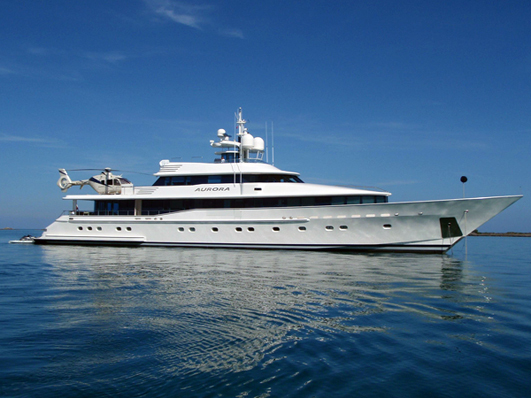 The generous luxury yacht M/Y AURORA A is able to accommodate as many as 10 passengers in addition to 9 qualified crew. 49.32 metres / 161.8 feet. Approximate Cruise Speed is 22 nautical miles per hour. Northern Lights 1 times 75 kilowatts, 1 times 50 kilowatts, 1 times 30 kilowatts. Frigit is the brand of AC used onboard. AURORA A features a teak deck. 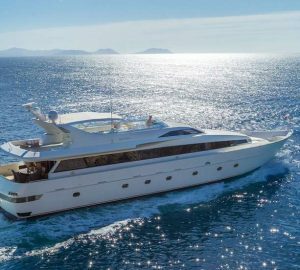 The luxury yacht AURORA A displayed on this page is merely informational and she is not necessarily available for yacht charter or for sale, nor is she represented or marketed in anyway by CharterWorld. This web page and the superyacht information contained herein is not contractual. All yacht specifications and informations are displayed in good faith but CharterWorld does not warrant or assume any legal liability or responsibility for the current accuracy, completeness, validity, or usefulness of any superyacht information and/or images displayed. All boat information is subject to change without prior notice and may not be current.